When a final drive motor stops, work comes to a halt. That’s why it is important to be aware of any indications that your final drive might need service. That way, you can arrange the downtime for repairs around a time that works for you, not be forced into downtime in the middle of a time-critical job. In this Shop Talk Blog post, we are going to talk about the four things to look out for, and what each symptom can indicate. Once these possibilities have been eliminated, then your final drive motor might be due for a servicing. A leak means a bad seal or a bad bearing. Aside from simply being worn out, seals and bearings can also be damaged as a result of a clogged case drain filter. Leaks need to be taken care of as soon as possible. If fluids are leaking out, damaging contaminants that can quickly destroy your final drive motor are getting in. Keep in mind that if a large amount of fluid is leaking out, it is most likely hydraulic fluid; gear oil is thicker and there is less of it to leak out. 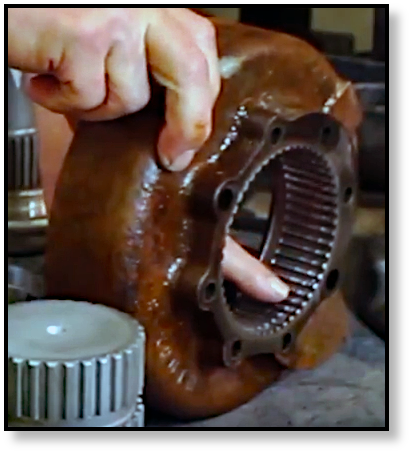 Gear oil leaks normally occur behind the sprocket and are often found dripping on the tracks. Regardless of the source of the leak, it is vital that it be addressed as soon as possible. A noisy or vibrating final drive may have some serious issues with bearings and / or gears. But if it seems to be more vibration than noise, the problem may just be a loose sprocket, which can be fixed by tightening the sprocket bolts. Excessive noise and vibration usually means that either some gears or some bearings are about to go out, which may cause cascade damage to other parts of the drive motor. 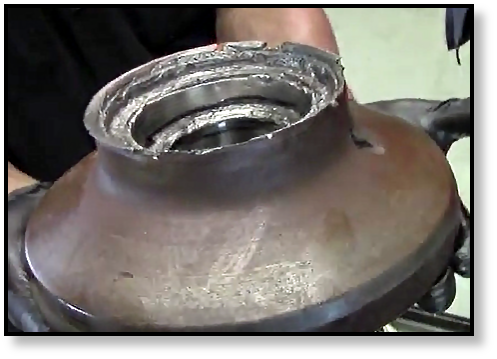 The image below is an excellent example of the extensive damage that can result from one bad bearing. Note that a shuddering final drive can be a sign of serious issues that must not be ignored. 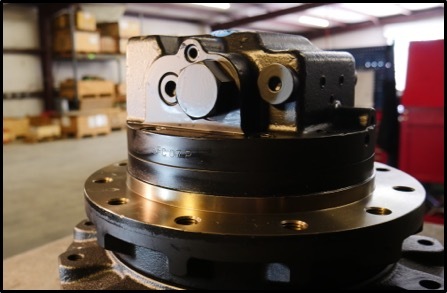 In short, symptoms of unusual noises and vibration often mean that there are some components within the final drive that have reached the end of their useful life and are ready to be replaced. Sometimes, a final drive will steam it touches water or be too hot for you to touch with bare hands. When that happens, your final drive is overheating, and it needs service. There could be one of several underlying causes: too little gear oil (which could be the result of a leak), overheating hydraulic fluid (which is a hydraulic issue and not a final drive issue), a weak charge pump, damaged brakes, or failed bearings. 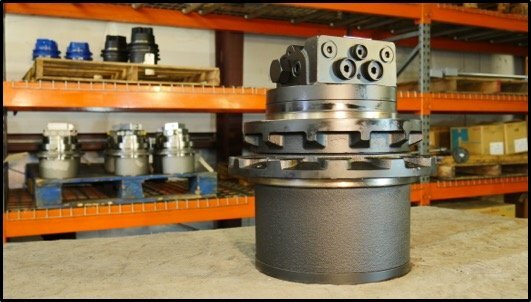 With the exception of hot hydraulic fluid, these possible causes for an overheating final drive all require service. Never ignore the following symptoms when it comes to a final drive motor: lack of power, leaks, noise / vibration / shuddering, and overheating. These are signs that your final drive may need service. Failure to address them can result in serious damage that could result in even more downtime and far more expensive repairs and replacements.